While I sing this song to lighten my mood, I’m well aware of the effects meeting have on my energy levels and health. Meetings take an enormous amount of energy—shifting from a quick conversation about Sunday’s bulletin to meeting with a grieving family who needs to plan their family member’s funeral, back to writing a sermon for Sunday before prepping for tomorrow’s Bible study is a challenge we all face. The challenge is balancing those four in a healthy way. Below are four realities of being a minister that force us to consider how our physical, spiritual, emotional and mental energy is zapped and/or lifted because of meetings and how we might best live into our call. We have to acknowledge this reality. They are how business gets done, decisions made and events planned; and there are a lot of them. I say this to squelch any desires to end meetings as we know them. The church is different than a business and we need to meet to make decisions because so many people are involved. People need to talk things out and share their opinions and we all need to consider the ramifications of our decisions. In addition, the work we do at the church is Holy and that doesn’t simply happen—it takes prayer, discernment, and courage because the decisions we make affect God’s people (and they have opinions!). So don’t try to get rid of meetings. Because meetings are a part of church life they will take energy to plan the timing and the contents of each meeting. This is when we have to be honest with ourselves and then with others. God didn’t intend for us to live life to the extremes by running from one place to the other with a stop at the fast-food joint in between. Be honest with yourself and listen to your body. Are you especially tired after a meeting or a day of meetings? What about that meeting (or day) was draining? Take notes on how particular meetings affect you. I now know that after meeting with a family who is planning a funeral service I need to take time to write down my thoughts immediately. I’ve canceled meetings or appointments because the work of crafting a homily for the Witness to the Resurrection service takes precedence over other work. I’m also freshest right after those meetings and can get my thoughts out to edit later. Where I’m growing is in my ability, to be honest with others about what I need to do in order to be faithful to my call. There are times when I simply don’t have the energy or clarity to be a full participant in a meeting. I’ve learned how to become the ministerial version of a baseball manager who can walk to the mound tapping my arm as I seek a reliever. I can’t always pitch a whole game! Delegate, delegate, delegate. The three hardest words for pastors to utter. It is easier to just do it ourselves, we say too often; it will get done that way and it won’t cause any controversy. Plus you are the paid staff and most everyone else is a volunteer. Stop. We believe in the Priesthood of All Believers (yes, I capitalized that for emphasis!) so live it out too. I need to hear this as much as others. People in our churches are way more competent than we give them credit. In their jobs and lives, they are managers, teachers, doctors, lawyers and a whole host of other professions who know how to lead a meeting, run a committee and lead the church. More often than not, they just need to be asked and given permission to lead. There are some committees at my church that function without much assistance from me. I meet with the committee chairs and make sure we are on the same page, but I don’t often attend their meetings. That’s when the Elders and Committee Chairs get to shine and do the Holy work of the church. There’s a reason we have seasons—both outside and inside the church. We need time to rest, to be contemplative, to be active and growing and time to be penitent. The liturgical calendar offers a seasonal understanding of life—so live it. Advent and Lent are busy times in the church, but summer is often a little slower. Don’t meet during Advent or Lent as a spiritual practice. 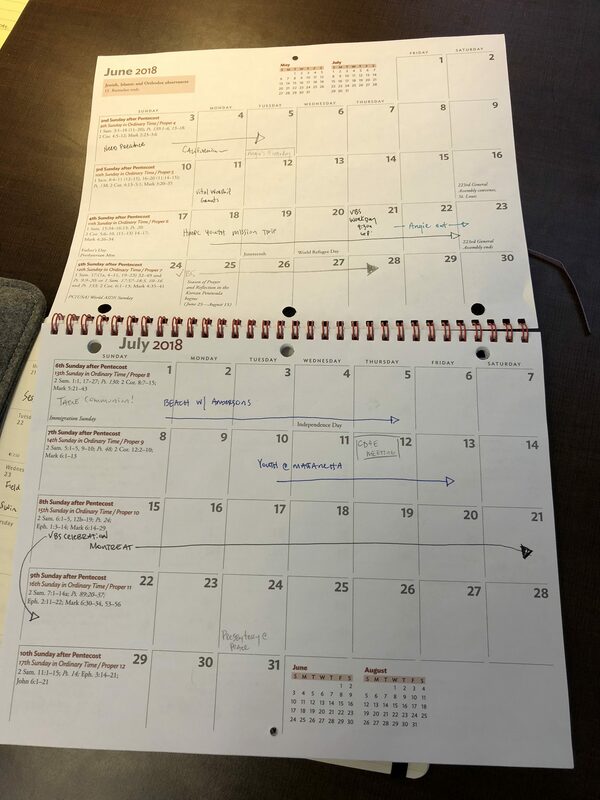 Look at your yearly calendar (both personal and church-wide) and plan your meetings in advance so you have time to prepare. Then be honest with yourself and others when people ask for a meeting. Is this a good time this week or could it wait until next? Build in seasons of dormancy when you can do what all pastors should do: USE YOUR VACATION. Don’t be that pastor. Use your vacation and go recharge. The work we do is demanding on a physical, mental, spiritual and emotional level. We are dealing with heavy (both figuratively and literally) stuff that takes time to process and decompress. We have to acknowledge that it is hard to plan a funeral service, lead that funeral service on a Thursday and then officiate a wedding two days later. Those are drastically different experiences and simply moving from one to the next without much thought or taking time to decompress is unhealthy and—in my humble opinion—unfaithful. We aren’t called simply to fulfill tasks on a calendar or an agenda; we also aren’t called to be a “one-person-show.” We are called to fulfill a Holy endeavor that will drain and supply our energy each day, if not each hour. We are called to participate in the Holy work God is doing in and through us and those around us. For those on the Board of Pensions plan, use your free mental health visits—talking to a trained professional is vital to our health. Read your Presbytery’s manual on vacation and time off—they often write great lines like, “Pastors should plan vacations that last at least a week so they can rest and be renewed.” Those resources are great when talking with your Personnel Committee and/or Session. Leave work early more often than you think you should. Getting out of the office, breathing fresh air and spending time with family and friends is healthy. 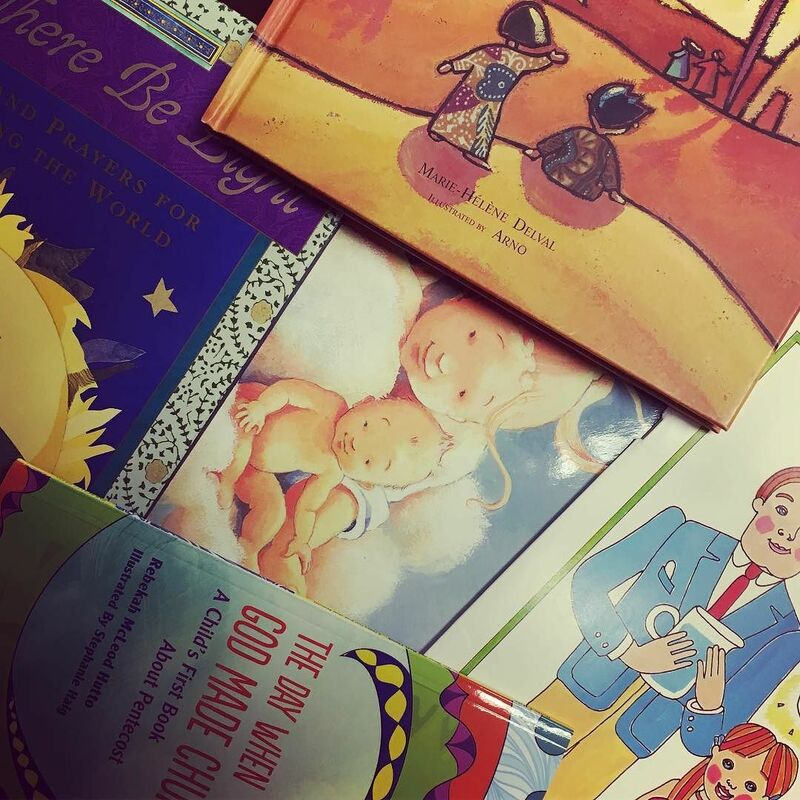 Schedule your own meetings with God, reading and/or napping (yes, I really do want to be a kindergartener again!) It is known that Rev. Eugene Peterson used to schedule time with Dostoevsky and that made him honor the fact that he was renewed through reading. Go add a “meeting” right now!